Heyburn State Park / 4 lakes area is one of the camping, boating, and fishing jewels of the state of Idaho. 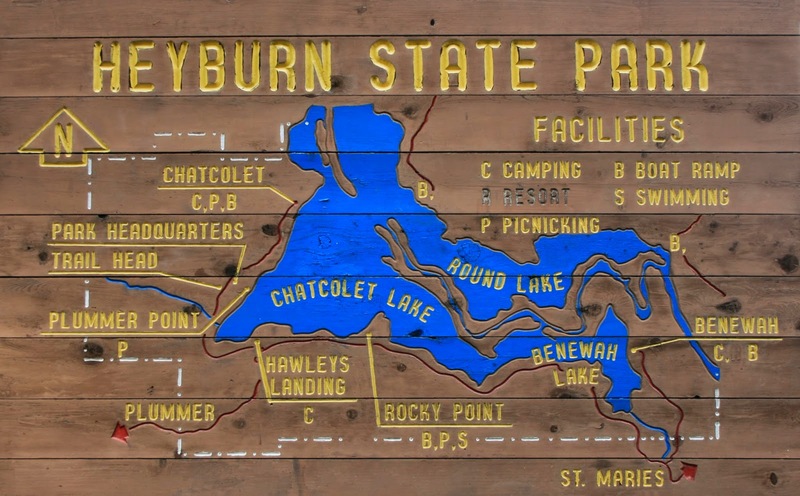 Heyburn S.P. consists of several large camping areas, cabins, numerous hiking trails, 3 boat launch facilities, beaches, and wilderness area. The bike trail called the Trail of the Coeur d'Alene is connected to this park. There are four lakes that were created/expanded by the Post Falls dam in this park area (and more beyond the park). The largest is Chatcolet Lake (off of St. Joe River). To the north of Chatcolet lake is Hidden Lake; to the east is Round Lake, and to the south is Benewah Lake. The St. Joe River (see info below and in the St. Joe River section of this site) runs through these lakes in a unique channel system that boaters can use to access the city of St. Maries and beyond. Connected to the St. Joe River in the City of St. Maries, is the St. Maries River. Lake Chatcolet is the largest of the four lakes. It consists of 600 acres and has more open water and boat launches than the other three lakes. Round Lake, the second largest lake, consists of 410 acres and is known for it's great fishing. However, due to all the aquatic vegetation and it's shallow depth, it isn't suited to high speed boating. You can sail in this lake but by mid summer there will be to much aquatic plant live fouling your rudders, etc. Benewah Lake is the 3rd largest; it consists of 400 acres and is another shallow lake with lots of aquatic plant life. This is another excellent fishing lake. The last and smallest of the 4 lakes is Hidden Lake, which consists of 90 acres, and is more like a bay connected to Lake Chatcolet and St. Joe River, than like a lake. Beyond the park and up river on the St. Joe River there is one large shallow lake (See lake Hepton) and 3 smaller lakes next to the St. Joe River. Lake Chatcolet is the only lake of the 4 I think are worth sailing on due to it's lower level of weeds and deeper water. The other 3 lakes are perfect for fishing and kayaking/canoeing. And again, the St. Joe River would be great to either motor or kayak/paddle up. Regardless of what style of boat you use, experiencing where the river runs through is a credible experience. Visit specific lakes via index for accessibility levels... Click Here!